As we all know, sharks are savage creatures. Since 1580, there have been approximately 2500 confirmed unprovoked attacks of sharks on humans. Of those, 475 or so were fatal. That’s more than one person killed by a shark every year! Humans, a far more advanced species, kill around 100,000,000 sharks each year. 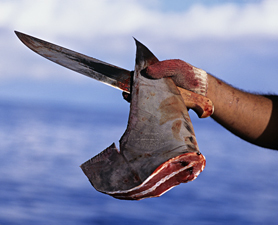 A large percentage of sharks are killed now for the noble purpose of cutting off their fins to make shark fin soup. Shark fin soup is a Chinese delicacy that is also enjoyed in other parts of the world, including the US. The fins are usually removed before the sharks are thrown back into the water alive. The process is known as finning and it consists of the removal and retention of shark fins and throwing the carcass back into the sea. The shark is most often still alive when it is tossed back into the water. Unable to swim, the shark slowly sinks toward the bottom where it is eaten alive by other fish. Many of the fins come from endangered species. Shark finning has increased over the past decade due to the increasing demand for shark fins (for shark fin soup and traditional cures), improved fishing technology, and improved market economics. Shark specialists estimate that 100 million sharks are killed for their fins, annually. One pound of dried shark fin can retail for $300 or more. It’s a multi-billion dollar industry. The worst part is that shark fin soup is largely a status dish–something that people eat not because it is nutritious or because it tastes good, but because it costs a lot.